The Chair of Council has announced the appointment of Professor Mark E Smith as our new VC, to start in October 2019. We are hoping that Professor Smith will prioritise coming to speak to the campus trades unions who represent frontline staff here and we look forward to welcoming him at Union House. While we were not allowed a formal role in the selection process we hope that our attempts to put forward staff views about the kind of VC we need have had some impact. 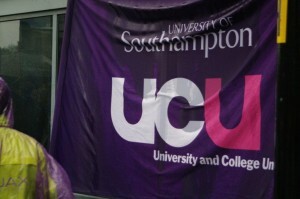 We delivered the UCU petition, and put forward staff views in meetings with the recruitment firm, and to senior managers. We said that we need someone who understands the damage caused by poorly managed organisational change and poor senior leadership practices. And above all we said that we needed someone who will listen to staff. We said that the new VC should have a salary and reward package more closely aligned with the public sector pay ratio. Professor Smith’s salary will be £287000, somewhat lower than the most recent VC’s pay and close to our request that the VC be paid “no more than 20 times the salary of the lowest paid employee in the University.” (Although this is before including the free house and other perks). We note that this salary does not seem to be much higher than his declared pay in 2015 (according to Wikipedia). We hope this is a good sign and that he might become a champion for our planned fair pay campaign. So what do we know about Professor Smith? His disciplinary background is as a physicist interested in nuclear magnetic resonance and this may make him understand parts of our University better than others. He is not be confused with the singer songwriter associated with the post-punk group the Fall. He did his PhD at Warwick in 1987. His bio leads us to hope that he retains some understanding of life at the frontline of teaching and research. (We are always hopeful here at UCU). While at Lancaster new links were forged with China, so he may have similar expansionist ideas to those of our previous VCs. This campus may account for his record as 14th highest VC spender on flights, and we note the environmental issues raised by these ‘offshore operations’ that perhaps conflict with our ‘sustainability’ ambitions. We are hopeful that he will have learnt from his experiences at Lancaster and perhaps understand why large expense accounts are so problematic when frontline staff have had below inflation pay rises and cuts to pensions in successive years. Those wondering about his relationship with the campus trades unions at Lancaster, might like to see him in action addressing the UCU Picket Line there last March. We will be talking to comrades at Lancaster UCU to find out more over the coming weeks, but our view at this time is to welcome this important appointment and to retain our optimism that Professor Smith will reverse some of the damaging senior management practices we have experienced. We sincerely hope he will work with us to help University of Southampton become Simply Better.